Bo Barron: What does 2013 have in store for CRE? Here is Bo Barron's take on what the 2013 CRE tech landscape will look like. There are some great nuggets here... 1. What CRE tech niche will be ripe for disruption or improvement in 2013? Mobile is it. There is nothing in the same ball park. The proliferation of high speed 4G and everyone under having an iPad (1,2,3,4,mini) or a smart pad that can surf the web make it crucial that CRE advisors take notice. We have to optimize our content for mobile users. I think more than half of web page hits by the end of 2013 will be from mobile users. You are already seeing blog traffic approaching those numbers. So ask yourself, how does your website render on mobile devices? 2. What popular CRE tech will pass its prime in 2013? This is a good question that I had to think about. I think desktop software is passing its prime. Michael Griffin of ClientLook talks about desktop software as technology legacy anchors. These desktop program chain us to our desks. Think about the CRM program you probably use. The future and the now is in the cloud. I use zero desktop applications - they are all in the cloud. Thus, I'm as productive and effective on the move as I am at my desk. And that is freedom! 3. What will be the most hyped (or anticipated) product launch in 2013? The two that I've heard the most buzz about are 42Floors.com and TenEightApp.com. Both of these products take tech tools to a new level in usefulness to advisors and our clients. 4. What is your one wish for 2013. 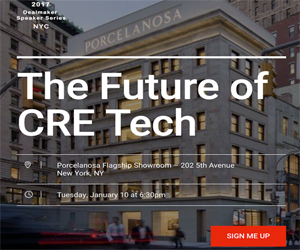 In other words, if you could see one thing happen in CRE Tech in 2013, what would it be? The CRE game is broken. It is inefficient. It is completely geared towards greedy brokers double-ending fees. Our industry does not serve the best interests of our clients. We serve the best interests of ourselves. We don't share information, and those with all the information charge you your first born to get it. What CRE needs, and this is my wish, is free and open information. We need Wikipedia to marry CoStar and have a child named Progress. If CRE had an efficient free market with complete information, our clients would sell their properties for more. The best buyers could be found more quickly. Fees would be proactively offered to the market to incentivize cooperation - for the good of the client. More deals would be done. It's just that simple. I doubt it will happen, but we are going for it anyway. That is my wish. Older PostChris Clark: What does 2013 have in store for CRE?